This time, right now, is unprecedented in Chicago: Our city is electing a history-making new mayor. She will take office at a time when there seems to be a collective awareness – a wokeness – that the only way our city and our region will make progress is with greater equity for all. Who is “all”? We are. We are the people whose voices the new mayor needs to hear. This year, On the Table conversations will become a Memo to the Mayor – a real and tangible way to let Chicago’s new mayor and her administration know how to prioritize what people want. Learn more about On the Table or sign up to host your own On the Table event. What does it mean to host On the Table? 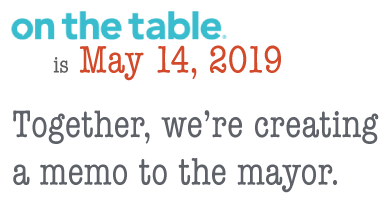 On the Table is a daylong civic conversation involving thousands of people all across Chicago and our neighboring communities. All events are held on Tuesday, May 14. Friends, co-workers and even strangers gather that day for mealtime conversations about topics that matter to them. Hosts can be individuals or organizations. Hosts select the topics, invite the guests, secure a location and arrange for modest food and beverage. (Some are held at restaurants or workplaces, while others are dining room potlucks or community-center brown bags; it’s absolutely up to the hosts!) To support hosts, a Host Guide offers provides step-by-step tips and experienced hosts offer encouraging insights. With so much energy around equity, public trust, transparency and accountability, now is the right time to use On the Table as a day of civic conversation to create a Memo to the Mayor. We invite you to join others in serving as a host. Why are we using a memo to express our opinions? Memos are used to communicate important information. They are concise and direct, asking for action and response. A well-done memo is a great tool for introducing a point-of-view, sharing recommendations and inviting follow-up. As important, memos are not nice notes, long reports or even tweets; memos mean business. We believe that On the Table conversations mean business, too, and at this particular moment in time, a memo is the best way to document what our community wants to tell Chicago’s new mayor. The best part is that when you create a Memo to the Mayor with On the Table, you are a part of something big and something smart. You can write your memo easily and in a number of ways – with pen and paper, or digitally on your computer or smartphone. 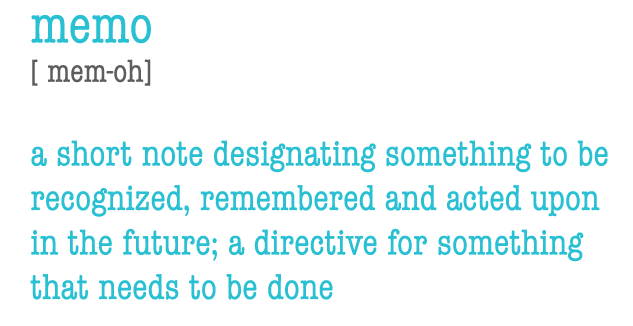 Hosts will receive full instructions on how to create and share their memos at the end of April. Will there be just one memo? How will it be sent to the mayor? We plan to collect thousands of memos from On the Table conversations across the region. Each of these memos will be documented, and each will be used to inform a single, compilation memo to the mayor, delivered by June 21, in a print and digital format. Altogether, the memos will be shared with the mayor and the summary information will be posted on this site. What should my memo be about? As a host, you will create a memo with your On the Table guests. It will reflect your table’s conversation, include your point-of-view, share recommendations and invite ways for the mayor and her administration to address a problem, make something better or otherwise follow up. Your memo can be made up of words only; it might include a photo; it might even include a poem. It is yours to create. What happens after the memo is sent? We will share the Memo to the Mayor by June 21. Afterwards, some hosts will be invited to join leaders of The Chicago Community Trust for a meeting to discuss the memo with City of Chicago leaders. Details of this event will be posted on this site in June. Do I have to live in Chicago to participate? Can my memo go to my mayor? Thousands of On the Table participants live across the metropolitan area, in suburban Cook, Lake, DuPage, McHenry, Kane and Will counties. We want everyone to join in and yes, your memo can go to your mayor. We will share details about how once you register to host. Is there any financial support for hosts? Underwriting is not available for hosts’ On the Table events. Hosts are encouraged to plan events that match their resources – their time, space and budget. On the Table events have been very successful, engaging and productive when held in living rooms, libraries, backyards, workplace breakrooms, public parks and schools, college classrooms and other no- or low-cost spaces. Hosts are asked to have at least 10 guests at their table; some have even more. Experienced hosts say that great conversation happens around any table, whether there is coffee with pastries or full-course meals. The Host Guide offers more tips and insights to help you plan an event you can afford. Sign up to host your own On the Table event.